In its latest report, the nation’s largest bank rating firm, BauerFinancial Inc, announced that NVE Bank once again earned its coveted 5-Star Superior rating for the 15th consecutive quarter. Financial institutions covet this status, and while we know our customers understand that “five stars” is a good thing, here’s a breakdown of what it actually means. What is a 5-Star Superior rating? According to Karen L. Dorway, President of BauerFinancial, “A 5-Star rating indicates that NVE Bank is one of the strongest banks in the nation, excelling in such areas as capital, loan quality, profitability and much more. Earning Bauer’s 5-Star designation proves that NVE Bank is getting it right.” She went on to state, “Community banks aren’t pushing products or services on you that you don’t need or want. They are there to provide a service and fill a need, which NVE Bank has been able to do seamlessly all while maintaining its pristine health.” We couldn’t have said it better ourselves! How do they determine their ratings? Each bank and credit union is required to file a detailed financial report with federal regulators on a quarterly basis. BauerFinancial obtains this data from the government, at which point it is subjected to a thorough analysis and compared with historical data for consistency. Upon completion of the analysis, a star-rating is assigned based on a scale of zero to five stars, with five stars being the strongest. Additional ratings below one star are also designated for institutions subject to various challenges and classifications, as well as those too new to rate. 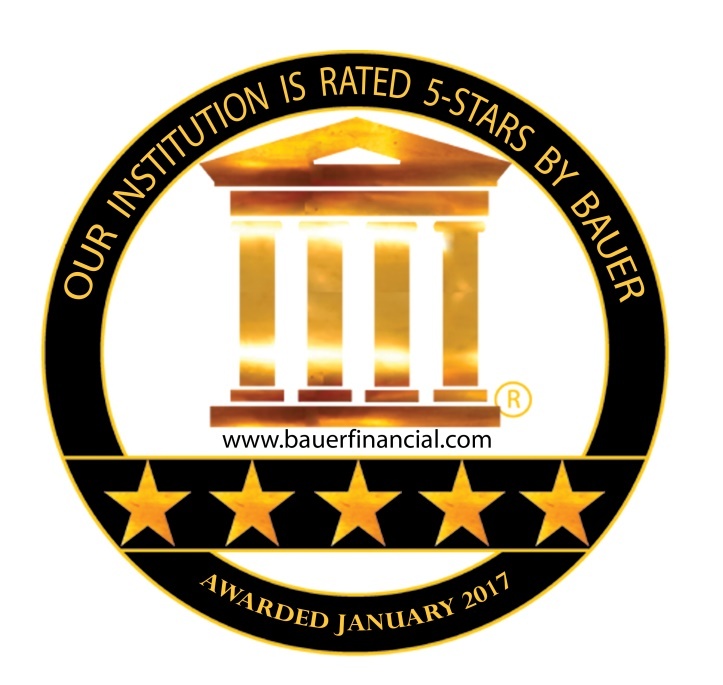 Criteria used to determine the BauerFinancial Star-Ratings include but are not limited to capital ratio, profitability/loss trend, evaluating the level of delinquent loans, chargeoffs and repossessed assets, the market versus book value of the investment portfolio, regulatory supervisory agreements, the community reinvestment rating (CRA), historical data and liquidity. Why should NVE Bank’s customers feel good about this? BauerFinancial, Inc. is not a financial advisor; it is an independent bank research firm. As such, it is a source for unbiased, independent bank and credit union star-ratings. No institution can, or has ever paid for a rating, nor can any opt out of it. This amounts to one simple fact: if you are banking with NVE Bank, you are in good hands. We are delighted to have received five stars, and there’s another number we’re just as excited about — a much bigger number: 130! Years, that is. In 2017, NVE Bank is celebrating 130 years of servicing the people of northern New Jersey! We have grown deep roots in and around the towns we’ve served since 1887, establishing ourselves as one of New Jersey’s strongest Mutual Banks with a singular focus on helping our customers, local businesses and communities thrive. Here’s to five stars and 130 more years! BauerFinancial isn’t the only place we’ve earned five stars; see what customers are saying about doing business with NVE Bank in the lender reviews on Zillow! For more information about NVE’s personal or business products and services, visit our website. You can also stop by your convenient neighborhood branch, or call us at 1-866-NVE BANK (683-2265). This entry was posted in Bergen County, Community bank and tagged Banking, BauerFinancial, Bergen County, community bank, New Jersey, NJ, NVE Bank. Bookmark the permalink.